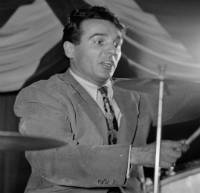 Gene Krupa (January 15, 1909 – October 16, 1973) was an American jazz and big band drummer, band leader, actor, and composer. Known for his highly energetic, flamboyant style and for his showmanship, Krupa is considered one of the most influential drummers in jazz history and one of the first major percussive soloists. He studied with Sanford A. Moeller and began playing drums professionally in the mid-1920s with bands in Wisconsin. He broke into the Chicago scene in 1927, when he was picked by MCA to become a member of “Thelma Terry & Her Playboys”, the first notable American jazz band—all-girl bands excepted—to be led by a female musician. The Playboys were the house band at The Golden Pumpkin nightclub in Chicago, and toured extensively throughout the eastern and central United States. Gene Krupa was also affiliated with Glenn Miller’s swing band in the 1940’s. Krupa made his first recordings in 1927, with a band under the leadership of Red McKenzie and guitarist Eddie Condon.